Yes, he has got a faulty technique. Yes, he finds it difficult to face short balls. Yes, he is not perfect for the longer format of the game. But no one can deny the fact that he is a very valuable limited overs player at the moment. And if you have any doubts about Suresh Raina, the ODI player, I will try to clear that up in this post. Lots of things have gone wrong for Indian cricket after the 2011 World Cup, but even during these tough times, there were some bright spots, Suresh Raina’s consistent performance in ODIs being one of them. He is undoubtedly one of the most dedicated Indian cricketers at present and has improved his batting a lot in the last 2 years or so. And then, he is a brilliant fielder, one of the finest India has ever produced. This is the one area which makes him a perfect fit for limited overs cricket. In July 2005, he made his debut for India at the young age of 18 against Sri Lanka and got out for a first ball duck to the legendary off-spinner Muttiah Muralitharan, and had a very poor start to his International career. His first fifty-plus score came in his 8th innings against England on a slow and low track at Faridabad. He scored an unbeaten 81 in that low scoring match and guided India towards an unlikely victory. If I remember correctly, a section of English media then even compared him to a young Sachin Tendulkar. But due to his inconsistency, he soon got dropped from the Indian team and wasn’t even considered for the 2007 World Cup. It was the inaugural season of IPL in 2008 which proved to be a turning point in his career, as he emerged as one of the highest run scorers in the tournament and forced his way back into the Indian ODI setup. He marked his return to International cricket with two hundreds against Hong Kong and Bangladesh and a 80+ score against Pakistan in the 2008 Asia Cup. But still, he was very inconsistent and kept on scoring runs in patches for the next two and half years, eventually losing his place to the another IPL superstar Yusuf Pathan. He was made to sit on bench for a major part of the 2011 World Cup, but when he got the opportunity, he grabbed it with both hands. That Quarter-final game against Australia proved to be another turning point in his career, and since then he has never looked back and has became a permanent member of the Indian ODI team. Later, he got an opportunity to captain the Indian ODI side in West Indies in the absence of Dhoni, Gambhir and Yuvraj. 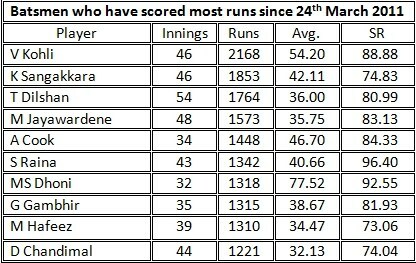 Looking at the chart above, you will find that Suresh Raina is among top 6 run scorers and second among Indians, only Virat Kohli has scored more runs than him during this period. Also, he has a strike-rate of 96.40, which is the best among top 10 most run scorers and that’s one of the prime reasons behind his continuous performance in ODIs recently. He maintains a good scoring rate throughout his innings and never allows pressure to get better off him. That’s why chases become easy when he is around. If you go by the average, Suresh Raina isn’t as successful as MS Dhoni or Virat Kohli. As I said earlier, sometimes stats lie. He has played many valuable cameos in the last 2 years and that’s why his average is on a lower side. But still it’s not that bad for someone who bats at No.6 or below. Suresh Raina’s batting average (40.66) since his comeback is slightly better than his overall average (36.55). But when you look at his performance in the sub-continent, it’s really impressive. Since India have played most of their ODI matches in the sub-continent during this period, it gives us a clear and bigger picture of Raina’s dominance and impact. He averages 51.76, compared to his overall average of 41.20, and it’s far better than his overall average across all continents. 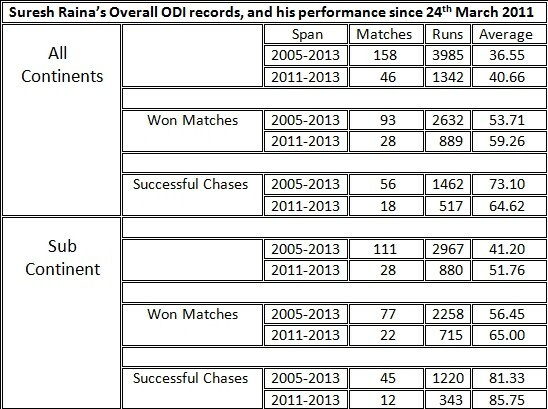 Now, look at Suresh Raina’s performances in the matches won by India. 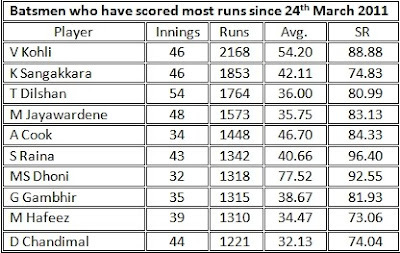 He has scored 2632 runs at a decent average of 53.71 during his career, which has clearly improved during the said period, as 889 runs at an average of 59.26 is superb. And when you compare it with his stats in the sub-continent, it’s very impressive. Since 24th March 2011, he has scored 715 runs at a fine average of 65, and that makes him a match-winner. As far as successful chases are concerned, his overall average shows his brilliance as a finisher and proves his worth in the Indian ODI team. He has scored 1462 at an excellent average of 73.10, which is higher than his average since his comeback. India didn’t win many matches, especially outside the sub-continent, during this period, and even during these tough times, he averages 64.62 and that’s not bad at all. In sub-continent, India have chased down a target 12 times successfully with Raina in the team in the last two years, and he has an amazing average of 85.75. Even during his full career, he averages 81.33 in successful chases. 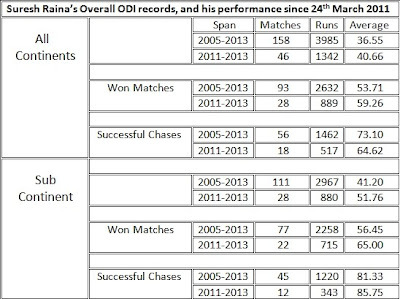 All these stats show how underrated Suresh Raina is as a cricketer. Now, only if he starts scoring runs more consistently outside Asia, India will become a far better team. And since the next World Cup is going to be played in Australia and New Zealand, he must start preparing for it. Today, Suresh Raina is just 26 and he already has a vast experience of International cricket. He has got the time, and the ability to take Indian cricket to new heights along with Virat Kohli.